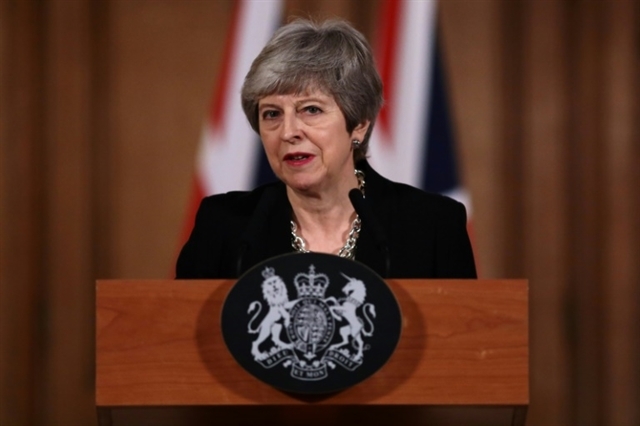 LONDON — Prime Minister Theresa May said Tuesday she would ask the EU to delay Brexit again to avoid Britain crashing out of the bloc next week, signalling she could accept a closer relationship with Europe to break months of political deadlock. After more than seven hours of talks with her ministers, May said she would request a delay that was "as short as possible and which ends when we pass a deal" through the British parliament. In a move which enraged the Brexit-supporting wing of her Conservative Party, she also offered to work with the leader of the main opposition Labour Party, Jeremy Corbyn, who favours closer ties with the European Union. "This is a decisive moment in the story of these islands. And it requires national unity to deliver the national interest," May said in a televised address. Corbyn responded saying he was "very happy" to meet. Brussels has set Britain an April 12 deadline to either pass the divorce deal it agreed with May four months ago, settle on an alternative, or leave the EU without an agreement. In reality, the deadline is even closer as the EU has called an emergency leaders summit for April 10. EU president Donald Tusk responded cautiously to May's statement, saying: "Even if, after today, we don't know what the end result will be, let us be patient." Britain voted by 52 to 48 percent to leave the EU in the 2016 referendum. However, the exit process has only exacerbated divisions among the public and politicians, including May's cabinet. Her statement follows weeks of turmoil. MPs have rejected May's divorce deal three times, but after seizing control of the process, were unable to come up with their own plan. May said she was "taking action to break the logjam". She noted calls in her own party for Britain simply to end its 46-year-old membership of the bloc without any agreement with the EU, but she said that "leaving with a deal is the best solution". May said she believed her existing deal was still necessary for an orderly Brexit, but offered to talk to Labour about a new plan for future trade ties. Corbyn has called for a new customs union with the EU and close alignment to the bloc's single market, two things that until now, May has strongly opposed. "I recognise my responsibility," Corbyn said, stressing that the most important issue was "to make sure we don't crash out of the EU next week with no deal". Corbyn said any new proposals could be voted on by parliament "early next week". If May and Corbyn could agree on a plan that MPs supported, the prime minister said she hoped to take it to the April 10 Brussels summit. The political chaos has already forced May to ask the EU to postpone the original Brexit date of March 29, but European leaders have warned they will not delay Brexit indefinitely. French President Emmanuel Macron said Tuesday that while he was "open" to a lengthy delay on certain conditions, it was "neither a certainty nor automatic". The EU's chief Brexit negotiator, Michel Barnier, warned that the other 27 EU nations were prepared for a "no deal" situation, and "it becomes day after day more likely". The EU has repeatedly refused to renegotiate the Brexit divorce deal it agreed with May last November after almost two years of negotiations but has said it could revise the accompanying political declaration on future relations. "What we need to focus on is our future relationship with the EU," May said of her talks with Corbyn. Key Conservative Brexit-backers slammed May's move. Former foreign secretary Boris Johnson said it was "very disappointing" that Corbyn was being given a key role in the Brexit process. Jacob Rees-Mogg MP suggested the Labour leader could undermined the referendum.